All of our rooms and apartments are equipped with hair dryers, telephones, Wi-Fi Internet and televisions with partial satellite reception. Complementary instant coffee and tea are available in the rooms. A breakfast buffet is possible for CZK 100 / 4€ per person. We recommend our pick-up service, especially if you are planning to fly in to Prague in the late evening. Our representative will be waiting for you in the airport’s arrivals hall and will take you right to the site of your stay. Must be ordered in advance. We provide a free connection to the Internet right in the rooms. There is also a computer with a printer at your disposal at the reception. The operating hours of the reception are 8 a.m. to 10 p.m. daily. Later arrivals are possible, but please announce them in advance. A safe for the storage of valuables is available free of charge. We will be pleased to assist you with the selection of organised tours around Prague or its surroundings, or we will help you plan your own trips or walks through Prague. For those of you who do not want to make use of the opportunity to do your own cooking in the fully equipped kitchens, we offer the possibility of a breakfast buffet for a fee of CZK 100 or EUR 4 per person. Located in each apartment. 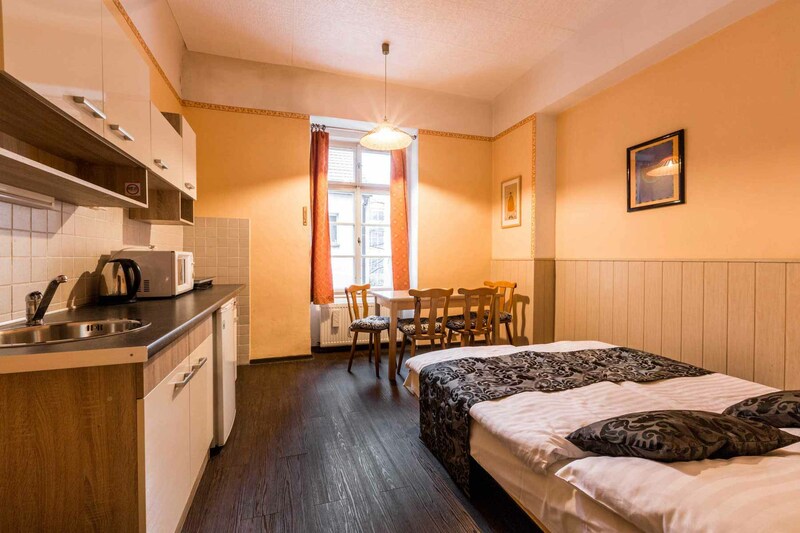 It is fully equipped and you will find the following here: refrigerator, electric kettle, toaster, electric cooker and a complete set of dishware. There is also sugar, salt, milk, coffee and tea available. All of our rooms and apartments are non-smoking and are part of a historical balcony-access building with a pleasant courtyard with outdoor seating. We have a capacity of ten rooms and apartments in various price categories. 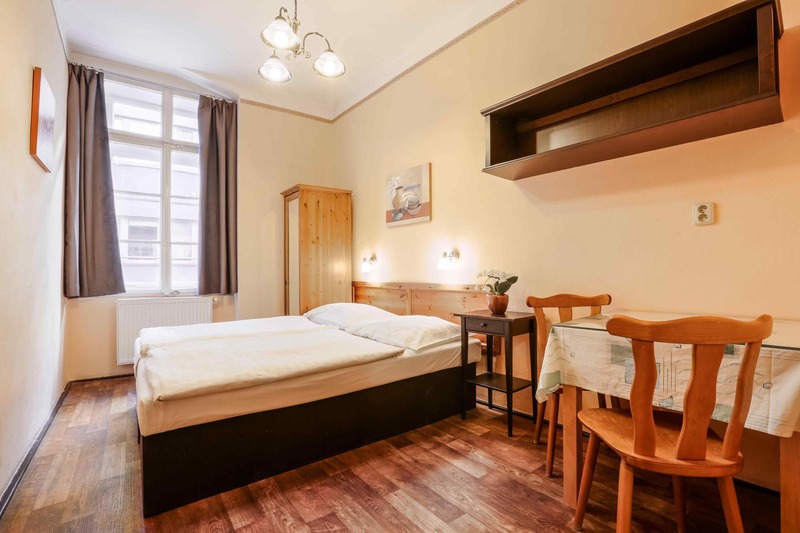 In addition to comfortably-furnished two-room apartments for the entire family, you can also find here studios or low-budget rooms with shared facilities All of the apartments are equipped with a Wi-Fi Internet connection, TV and telephone, along with a fully-equipped kitchen. The basic price of the room includes: energy consumption, bed linen, bath towels, hand towels and dishcloths, room cleaning every 2nd day and final cleaning. We can prepare a cot or a crib in most of the rooms upon request (must be ordered in advance). Parking is possible for a fee of CZK 350 in a nearby location (Stárkova Street).